Oh Thank You Miss Aida! Thank you for helping me again St. Expedite! I am very grateful for my raise! So do you think that now that I've finished burning the Saint Expedite candle that it would be alright if I get the candle ministry to burn a St.Expedite candle for me as well? And you may get a clearer idea with the candle report. I just wanted to ask you if would be alright if I slowed down or stopped putting the Expedite oil and sachet powders around my room with lottery tickets? because its been almost 1 month since the Saint Expedite candle burned out. I will still get the candle ministry to burn a saint Expedite candle on my behalf. If this were me, and had a choice: I would continue the work (but slow it down just a little). To stop abruptly may show that you lack faith in him. He granted my petition in the time frame i asked. I was so surprised because it seemed like it was never going to happen. Then when i started praying to st expedite, it happened! I swear my boyfriend would never have moved in with me if it wasnt for st expedite! I use (to some extent) the pendulum as a form of divination. I think I will do what you say and see if he wants to help (maybe not, as 2 weeks are quite a lot for St. Expedite I assume). I also read the other day on this forum that St.Martha is not very keen when it comes to working with men. Am I right? Maybe I should try with St. Anthony. Lately, I have been hearing a lot from clients who have worked with St Anthony and have had great success. Started yesterday with my prayers towards Saint Anthony. I lit him a red candle and the shape seems to be a head with "afro hair" (Like Marge Simpson type of hair). Thank You for your help, it's just that with the candle now finished burning and I really just want to leave this neighborhood I am trying to move on and get myself into a situation where more money can come to me so I can leave. I guess I'm just tired & stressed out about it. 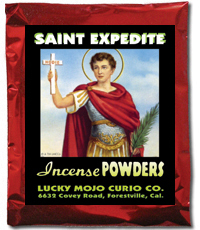 I will continue to use the Saint Expedite oils with the sachet powder even though its all that's left. You have put up with a lot of crap from your nightmare neighbors. Thank You for your understanding kind words. If I do a request to Saint Expedite on behalf of someone else, who gives the payment of pound cake and flowers? Do I? Or do they? Would I be able to petition St Expidite to bring in clients? I have a job, I own a business. But i would like more/new clients. Thank you once again, Saint Expedite. In just 3 days you granted my request! St Expedite, I thank you for granting my petition, at the speed of light! I will continue to spread your name. Thank you Saint Expedite! I made a special trip to get your pound cake, enjoy! Thank you St Expedite for answering my prayer for help last night. I bathed and incensed myself with Black Cat for luck and anointed myself with St Expedite in asking for help. Today I was answered in my favor. I have not even established my altar here at the new house yet. Certainly St Expedite will receive a generous offering in thanks. Thank you Saint Expedite for answering my prayer's about receiving the full amount of money due to my significant other. We are grateful for all you have done. Thank you St. Expedite for hearing my prayer. Thank you St Expedite for helping me with the first part of my petition. When the second part comes thru I will give you your 3 shots or rum and 3 slices of pound cake. I will also thank you again for completing the job. I thought I would mention this for those who know St. Expedite. As a Saint, he can also help you learn to stop procrastinating and developing more discipline in your life. I know this has helped me, and I was a famous non-procrastinator! This is another way he can also help you with money troubles, as sometimes we need his fast aid and betterment in getting to whatever it is we need to do. Blessed Be St. Expedite for helping me. I appreciate your aid as a small business owner, and thank you for helping me stay moving on my feet! Thank you Saint Expedite for answering my petition in such a quick manner. I am grateful to for your assistance and will continue working with you. Thank you again. Thank you Saint Expedite once again! You never let me down! I just want to say Thank you so much St.Expedite for answering my petition. You came through for me and I want everyone to know how helpful and powerful you are. St. Expedite thank you again for your kindness and help! I asked for your immediate assistance and you helped me again. You are powerful and I hope that this will serve as a testimonial of your power. Thank you Saint Expedite! You always help me out so quickly! Enjoy your payment. I am not sure if i am posting this in the right section. Please forgive me as I am new here and was looking for the Thank you section. I just wanted to give Saint Expedite his Public thank you for completing my petition in a timely manner. Thank you Saint Expedite for completing my petition once again. I cant thank you enough. You have started to change my life for the better and now able to do a few things that i have always wanted to accomplish and I am bless and fortunate to have a great working relationship with you and will continue to improve our communication as we work together. Thank you Saint Expedite. Thank you so much Saint Expedite for always coming to my aid so quickly! Thank you for your quick action in assisting me. You are so awesome!! Saint Expedite, you never cease to amaze me! A million thanks, and I am defrosting the pound cake for you. Wow! Saint Expedite you are amazing! 24 hours after petitioning you for assistance you got the money flowing that I had asked for. I am publically posting here, in your name, so others will know how remarkable you are. Flowers and pound cake are on the way. I just wamt to share my experience here, like i promised saint expedite. I didnt make an official prayer or light any candles but thank you saint expedite for granting my petition. I have no doubt this was you. My intentions were there but i underestimate your power yet you still gave me positive results. I asked saint expedite to convince my ex to contact me and try to make up for how he has hurt me and to look for a friendship with me. Not a week after i wrote that prayer, i get a text with exactly that. Im not looking to be romantic wirh this boy but im so glad to have him back in my life. I love you saint expedite. I will bring you flowers tomorrow to further thank you for your help. I love you. Hello maybe my question been answered before but I couldn’t find a specific answer. Today I want to ask St.Expedite for financially help. I heard that he doesn’t work well with other saints and currently I have an altar for St. Martha with flowers and offerings in my crib. So my question is can I still ask St.Expedite for help? Can I make another alter for him in the same crib? I don’t want to do anything wrong or make both Saints angry. I love St.Martha and she helps me very well. I would put him on a separate altar. Thank you Saint Expedite once again for granting one of my need. You are an Awesome Saint and I am grateful to have the opportunity to work with you and communicate with you everyday. Thank you so much Saint Expedite. Enjoy the red wine and fudge while I go out and get more pound cake! You came through even faster than expected! Thank you Saint Expedite for granting my wish!! You came through for me when I needed you and I hope many more see this and praise your name! Thank You Saint Expedite for granting me my petition in just a few hours. You are truly a blessing and I appreciate you and what you have done for me in time of need. I hope you enjoy your offering. Thank you Saint Expedite for granting me my petition! I happened a few days after lighting the candle. I hope you have been enjoying your offering! Thank you again Saint Expedite! Enjoy your reward, I'll be asking for something else before you know it! Thank you Saint Expedite for helping answer my prayers and petition! Your intercession was much needed and I thank you for pulling through for me as always. You made sure everything played out for the highest good of all and I am grateful. Thank you for your patience, your grace, your favor, and your help. I have more to get before the time I've set but I hope you enjoy your well deserved offerings!! Thank you Saint expedite for everything you have did for me and thank you for your speedy help. you granted my petition just on time. thank you for working with me. Thank you Saint Expedite, wonderful as always! Enjoy your extra special reward! Question: I have been petitioning St Expedite about the same thing, but he doesn't really 100 percent come thru at no fault of his own. It's just that the agency is so freaking slow and behind. Should I wait to see more movement. He didn't actually get me by offer letter or start date, but he got me closer to those things by starting the background. I'm so tired of doing damn sugar jars on these people. So annoying, but I have to do another one by Monday on this lady that's reviewing my background. I went off topic, but my question is should I wait a little bit to see what else St Expedite does. I did talk to him and ask him if he can continue to work for me so that I can give him his shot of rum, pound cake, & flowers, but I'm not sure if I should continue to wait or pay him then start a new petition on Monday. Or on Monday I can resume lighting candles for him and ask him for what I want w/ a partial payment of one item to motivate him to continue to work for me. What do y'all think? Also, can I use a powder if I'm not actually giving someone paperwork. I have to scan everything to give to them about this job. Miss Aida my petition is actually very clear. I am just asking for my start date and offer letter from the company. That's legit almost the petition word for word. He has been working hard on it,but it's the company. I feel like at this point he knows this job well. I'll just give him everything tomorrow (I have mouse so I can't leave anything out overnight) and start over on Monday. Thank you Saint Expedite for helping me pull through my task and helping me to complete it before a very strict deadline! I’ll set out the pound cake out now so you can have it tonight! Thank you!! !